My sister and I have a special place in our hearts for all things tacky or gaudy. Glitter? Yep! Rhinestones? You freaking know it! 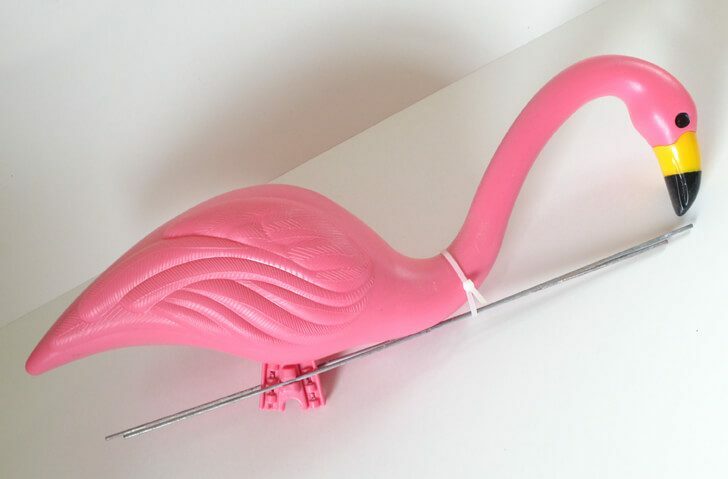 So when I bought up some lawn flamingos and realized that the neighbor’s dog had torn the first one I put out up I realized that the second little guy wasn’t going to do well in my garden. To be honest I had a feeling and so that’s why one went as a sacrificial lamb. Poor thing. 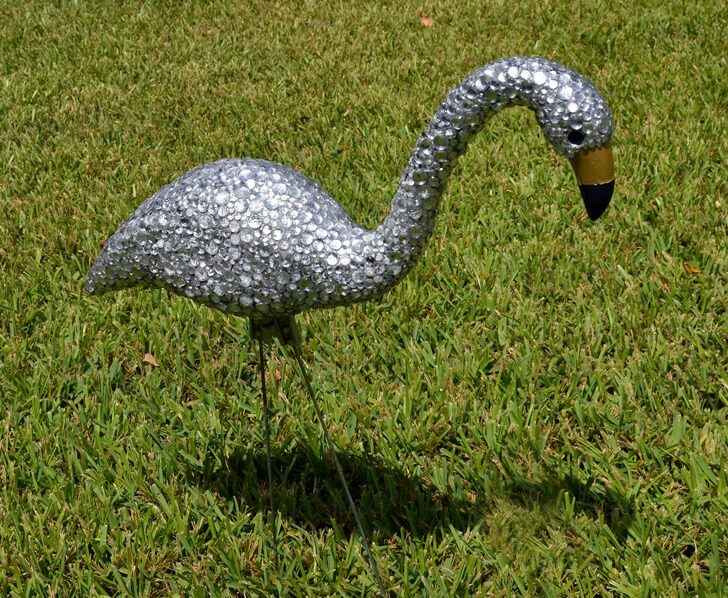 So I asked my sister if she wanted a rhinestone covered flamingo. 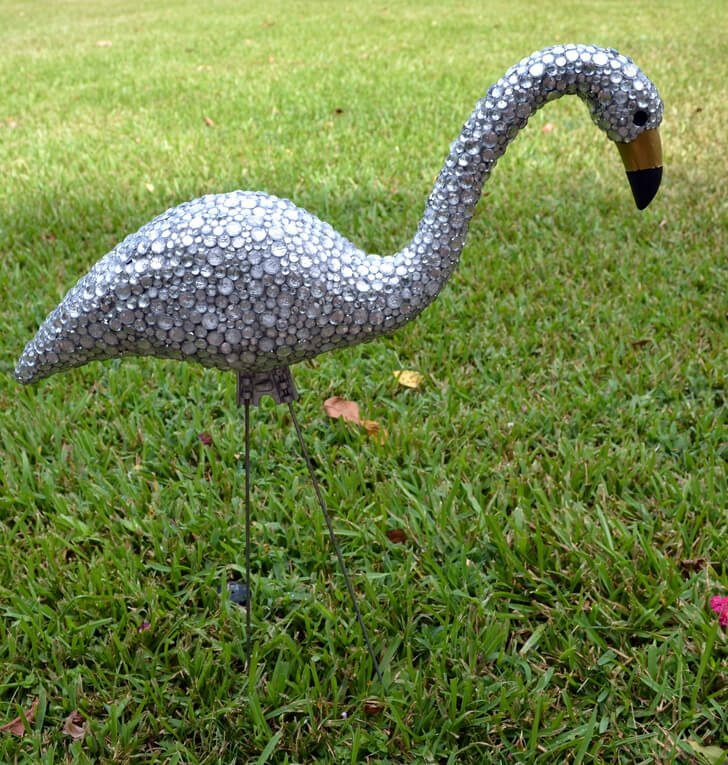 Her response was something like “why WOULDN’T I want a flamingo covered in rhinestones?” So here we go! 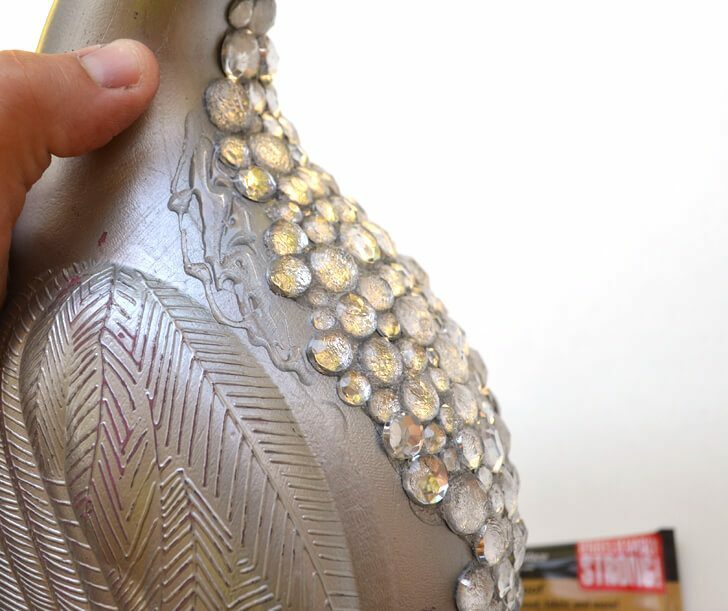 Give your ‘mingo a base coat in silver so that the plastic visible around the rhinestones won’t be that visible at all. 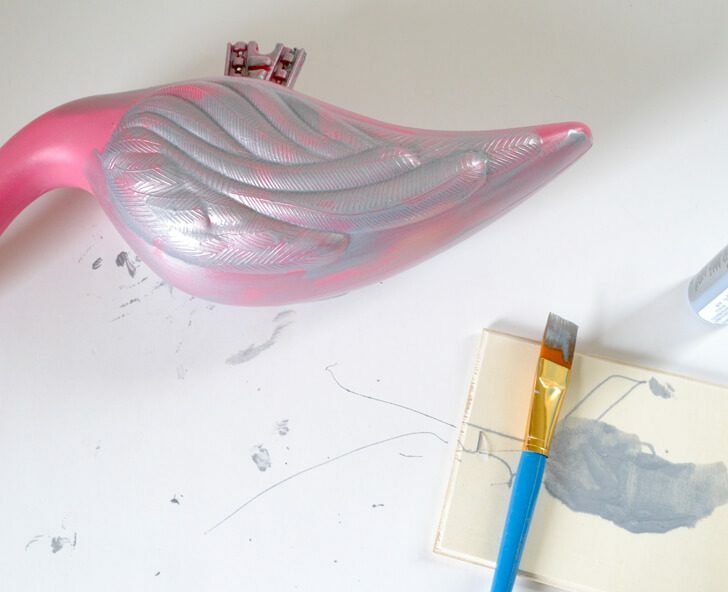 The pink would stick out like a sore thumb but the silver will blend right on in! Allow to dry completely. Several days, actually, won’t hurt. 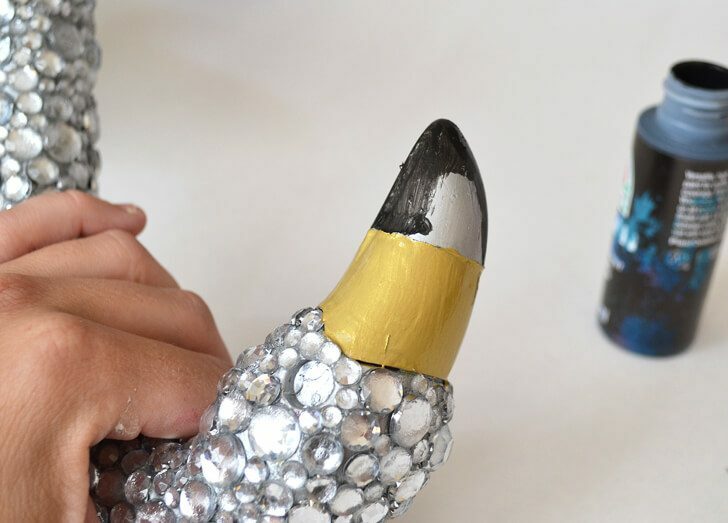 You can use spray paint or acrylics. Whatever you have on hand is awesome, though I found the craft acrylic chips far less on plastic. I am an iLoveToCreate blogger so I write posts over yonder and get lots of cool iLTC brands of craft supplies like Tulip and Puffy and Aleene’s. 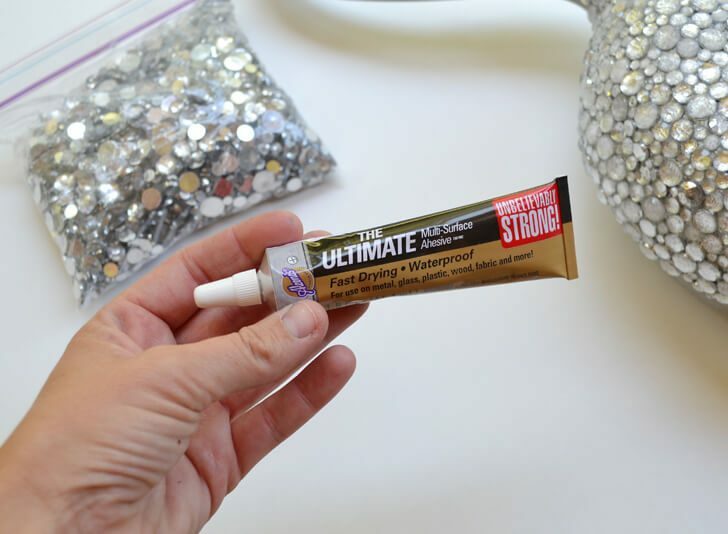 This is a new glue called “The Ultimate” and it’s crazy strong. It’s very similar to e6000 which is another brand of glue. I actually like this one better after having used up an entire tube because it dries super fast so there’s no watching your rhinestones slide everywhere for a few minutes waiting to continue. You quite literally just keep on a gluing here. Plus I like that I can use it inside with no windows open. I’m not sure if it is advised but I was able to sit in the den and glue theses puppies one after another in the comfort of the air conditioning on a 108° and that was super fab. Just start wherever you pleas and apply a small amount of glue. Seriously go small because this stuff truly does dry super quick. Push your stones around in the we glue using different sizes to get the most into the space. Keep on keeping on and touch up your paint as needed. I get wild and crazy with my crafts, think the Swedish Chef with a hot glue gun, so I had a few knocked around areas to take care of. In all, I used almost a whole tube of glue (use your 40% off coupon at Michael’s!) but that’s largely because I kept putting down too much glue and having to re-glue on top of the dried stuff. Super wasteful :/ I used right about half of the tub of rhinestones I got from Hobby Lobby (also a 40% off coupon) so I think you could easily knock out both in the set if you wanted to! I thought I wanted full on rhinestones but in the end I wanted a black eye, and a gold and black nose so I painted OVER my silver paint. In the end, I think this was totally the right way to go! This wasn’t a quick 20 minute project. It was more of a time investment and I probably spent about 2 hours attaching the stones. The good news is it is mind-numbing work so you can easily watch television or chat while you’re doing it so it seems like no time at all. 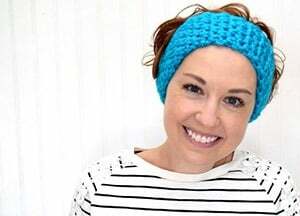 And like an afghan, you can pick it up whenever you want and then put it right back down again when you’re over crafting! 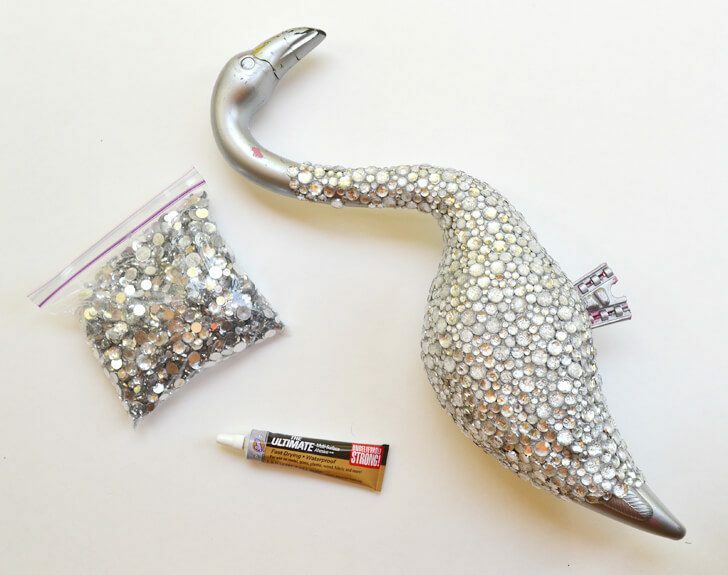 As soon as I saw this I went on Amazon and purchased the glue and the rhinestones. I love the whole idea of this project. This is the best idea ever! My daughter-in-law is obsessed with bling. I am SO making this for her! Too cute. Thanks for sharing. I found you on Pinterest and am so happy I did. 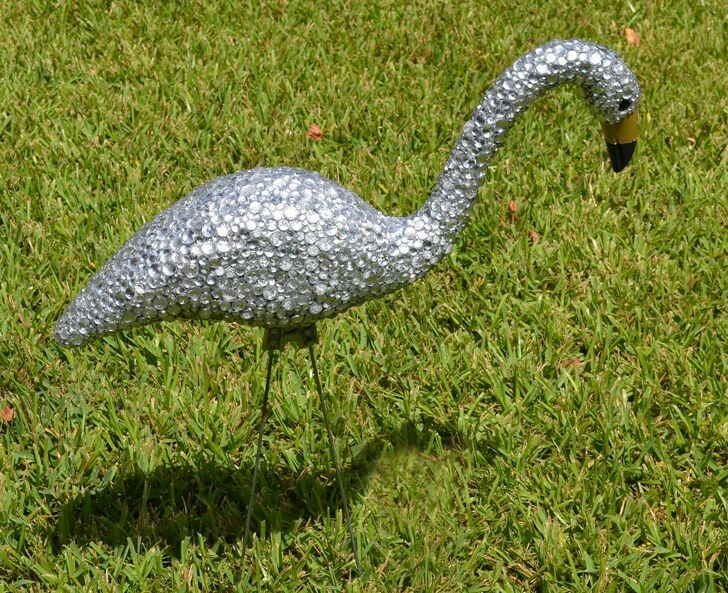 I have looked at other blingy Flamingos and none were done with weather in mind. But I believe yours will. Thank you and guess what I will be making soon. Yay for Pinterest! 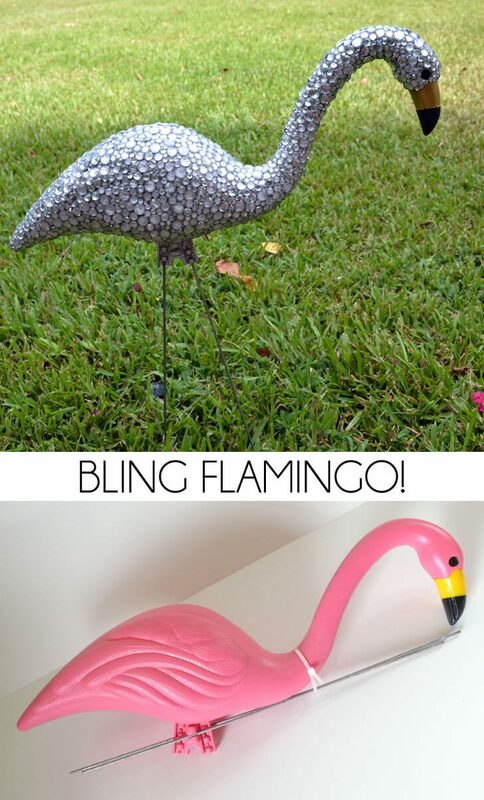 It’s been a while since I’ve seen the bling flamingo but the last I did it was going strong! Best of luck!